(BOSTON) – Toward the ultimate goal of engineering human tissues and organs that can mimic native function for use in drug screening, disease modeling, and regenerative medicine, a team led by Jennifer A. Lewis, the Hansjörg Wyss Professor of Biologically Inspired Engineering at the Harvard John A. Paulson School of Engineering and Applied Sciences (SEAS), and Core Faculty member of Wyss Institute for Biologically Inspired Engineering, has made another foundational advance using three-dimensional (3D) bioprinting. This work builds upon their demonstrated ability to bioprint tissue constructs composed of multiple types of living cells patterned alongside a vascular network in an extracellular matrix. The Harvard team has also previously shown that these constructs could be scaled up to create thick, vascularized tissue constructs, sustained viable for more than a month in vitro. Now, in close collaboration with Roche scientist Annie Moisan, they have leveraged their bioprinting and materials expertise to construct a functional 3D renal architecture containing living human epithelial cells, which line the surface of tubules in the kidney. The study appears online in the journal Scientific Reports. “The current work further expands our bioprinting platform to create functional human tissue architectures with both technological and clinical relevance,” said Lewis. The 3D renal architecture created by Lewis’ team mimics a proximal tubule, a serpentine hollow tube that is an essential part of each nephron. Every human kidney has over one million nephrons, which perform the vital function of transferring components between blood and urine. Inside the convolutions of a nephron’s proximal tubules, 65-80 percent of nutrients are reabsorbed and transported from the renal filtrate back into the bloodstream. Therefore, the bioprinted 3D renal architecture recapitulates a very small – yet critical – subunit of a whole kidney. Lewis’ team achieved this advance by adapting their earlier approach for bioprinting living cells to form thick tissues. Using a customizable, 3D-printed silicone gasket as a mold, they begin by casting an engineered extracellular matrix as a base layer. Next, a “fugitive ink” (which is eventually liquefied and removed from the final architecture) is printed in a convoluted, winding tubular shape similar to the structure of natural renal proximal tubules. This printed feature is then encapsulated with another layer of extracellular matrix. Finally, the entire construct is cooled, the fugitive ink is removed, and the result is an open tubule embedded within extracellular matrix. 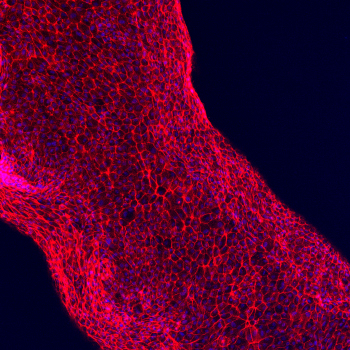 A single inlet and outlet on opposite ends of the tubule are first perfused with cell growth medium and then human proximal tubule cells, which quickly begin to adhere to the lining of the open channel. Eventually, these cells orient into a tightly packed monolayer that lines the entire length of the 3D renal architecture and acts as a cell barrier between the inner lumen of the tubule and the extracellular matrix outside. Nutrients, which perfuse the tubule through the inlet and outlet, nourish the living cells and a keep them alive and functional for more than two months. As the cells mature, the 3D renal architecture begins to perform the same important duties as a natural nephron’s proximal tubule. Drugs or other factors can be pumped through the 3D renal architecture to investigate their nephrotoxicity and overall effects on the proximal tubule cells. Co-first authors of the study Kimberly Homan, a Wyss Research Associate, and David Kolesky, a Wyss Postdoctoral Fellow, stress that the most exciting aspect of the work is that – far beyond mimicking the form of the kidney’s proximal tubule –it is a credible in vitro model that functions like living kidney tissue, representing a significant advance from traditional 2D cell culture. The team devoted great effort to characterizing the structure and biological function of the model. As a result, their approach could one day be scaled up and translated into an implant or organ-assistive device. In the near term, it may offer clinicians a patient-specific tool for assessing treatment options or diagnosing diseases and also give the pharmaceutical industry a powerful way to determine how drugs impact the health and function of the kidney’s nephrons. “The use of functional tissue-like models during pre-clinical studies will provide unprecedented insights into human-relevant drug response prior to clinical development,” said Moisan, a Laboratory Head in Mechanistic Safety at Roche and author of this study. As a fabrication platform, the approach is flexible, scalable, and adaptable, meaning that in addition to working towards larger, scaled-up kidney constructs, the team also plans to explore development of other types of complex functional human tissues and organs. In addition to Lewis, Moisan, Homan and Kolesky, other members of the Wyss-SEAS research team and co-authors of the Scientific Reports study include: Mark Skylar-Scott, Jessica Herrmann, and Humphrey Obuobi.